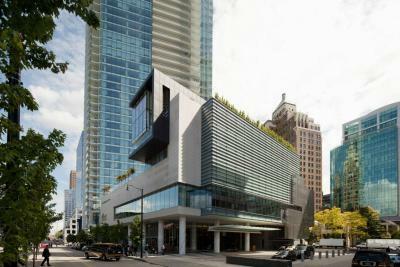 Lock in a great price for Fairmont Pacific Rim – rated 9.3 by recent guests! Amazing view of the bay and mountains. Room was super comfortable and clean. 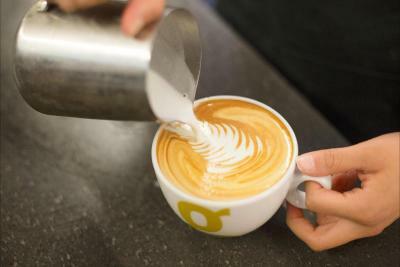 Great in room coffee. In room technology (tv in bathroom mirror, iPad controls blinds, temperature etc) was great. Lobby smells amazing. The service was exceptional. Every time we would leave our room, and come back at different times in the day, our things were cleaned up, and at night, having the bed turned down, with fresh water, was absolutely amazing! Also, the chocolate served on our first nights, was an excellent treat. 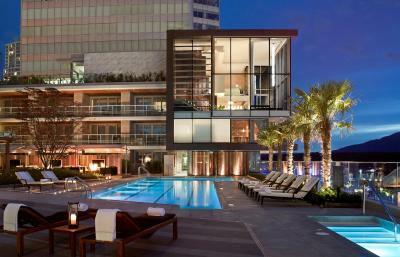 Loved the quality of room and service; perfect for my birthday weekend celebration that embodied relaxation and comfort. The staff is amazingly friendly! Everyone we met, even the housekeeper, greeted us as a friend would. Amazingly helpful and accommodating! Love this hotel and keep coming back. Such a great getaway where we always feel pampered. It was absolutely wonderful! We really loved having the car service take us everywhere. 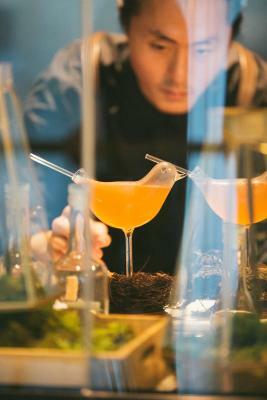 Great location for sightseeing, with a great restaurant the Botanist. Very friendly and helpful staff. 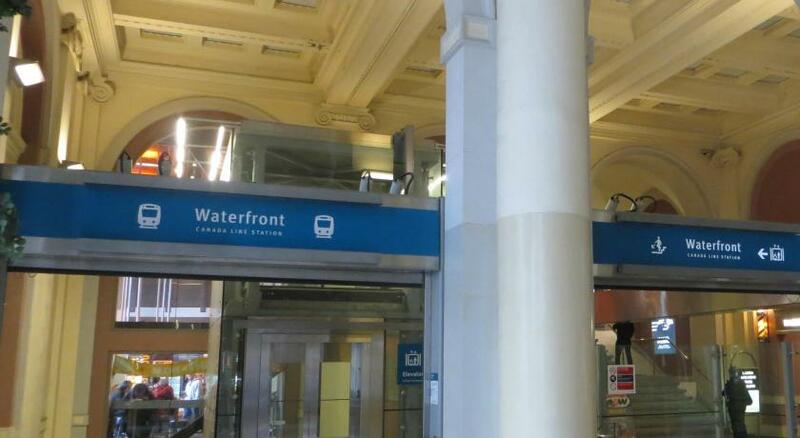 Has free car service on a first come basis to any location in the downtown area. Excellent amenities in the room. Location was very central. There was enough to do in the hotel we could have never left the property and still had a wonderful vacation. This is a world class hotel. 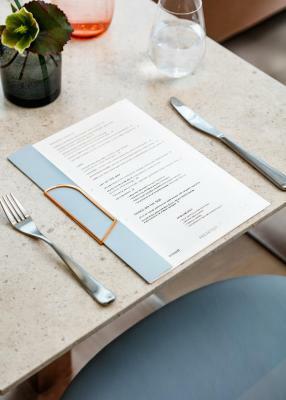 Everything is immaculate and well executed, the service is great, the rooms are fresh and modern and if you happen to get a sea view, it's simply stunning. 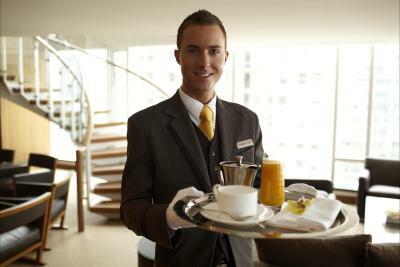 I have stayed at top hotels in London, Paris, Monaco, and New York. This is on par with the best of them. 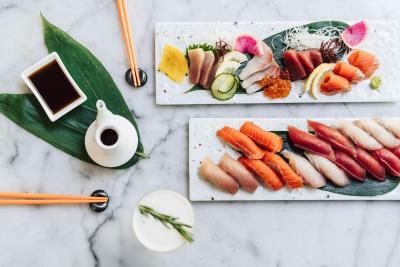 Fairmont Pacific Rim This rating is a reflection of how the property compares to the industry standard when it comes to price, facilities and services available. It's based on a self-evaluation by the property. Use this rating to help choose your stay! 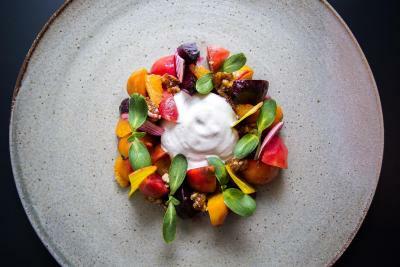 One of our top picks in Vancouver – and a guest favorite. 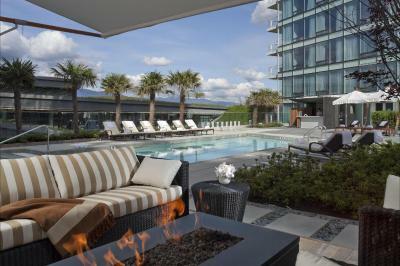 Featuring a rooftop pool with fire pits and a hot tub, this Vancouver luxury hotel offers a full-service spa and a 4,000 square foot gym. 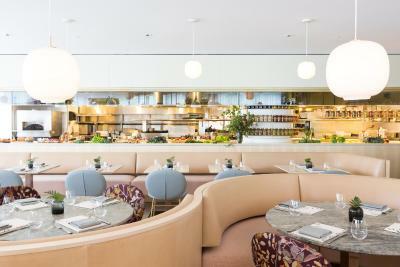 An on-site lounge is provided. 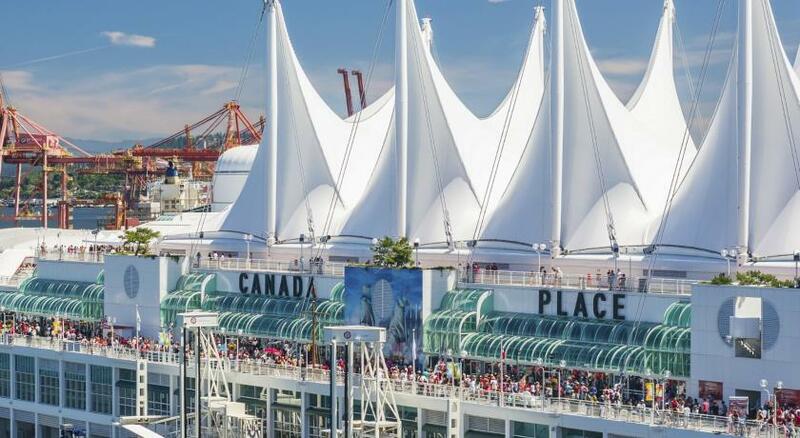 Stanley Park is 9 minutes' drive away. 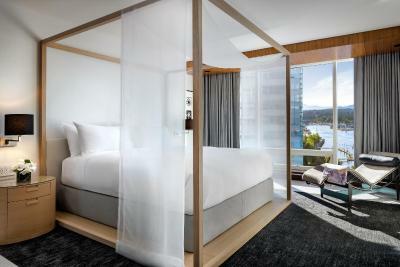 Flat-screen TVs with pay-per-view movies and laptop connectivity are provided in each room at the Fairmont Pacific Rim. An iPod docking station, iPad2, an in-room safe, and a coffee maker are available. Bathrobes are included in the private bathrooms. 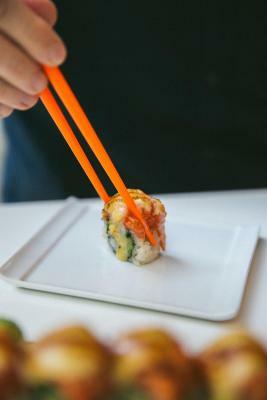 Open for lunch and dinner, The Lobby Lounge and RawBar features nightly live music, sushi, and handcrafted cocktails. 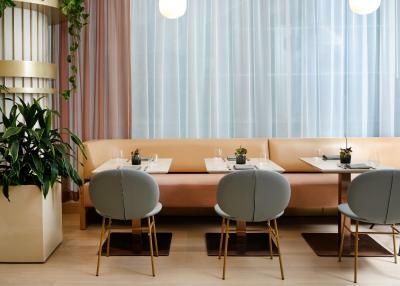 Giovane cafe + eatery offers Italian cuisine and coffee for breakfast, lunch, aperitivo, and weekend brunch. 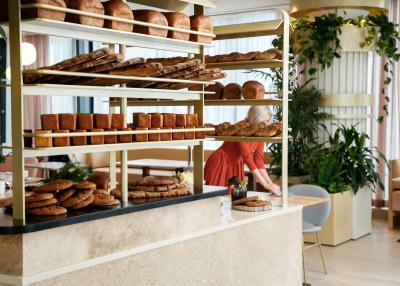 Giovane market celebrates artisanal items. 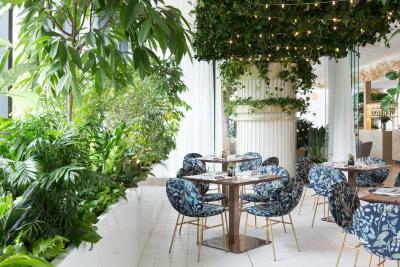 Featuring a bar, outdoor terrace garden, a dining room and lounge, Botanist Restaurant offers a menu inspired by the principals of botany, organic farming and sustainable sourcing. 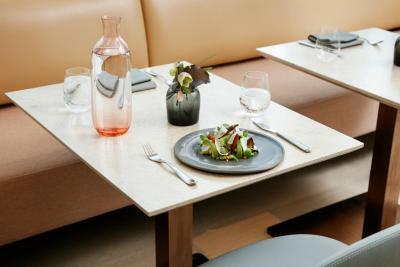 24-hour in-room dining is also available. 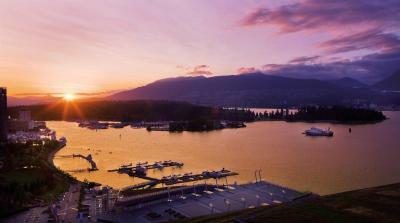 The Fairmont Pacific Rim is a 5 minute walk from the Canada Place, home to Vancouver’s Convention and Exhibition Center. 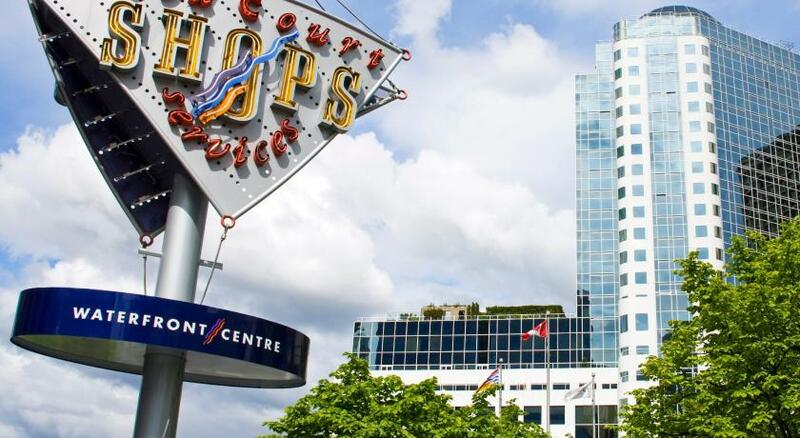 Robson Street shopping area is 15 minutes' walk away. 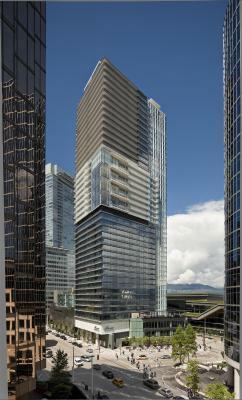 When would you like to stay at Fairmont Pacific Rim? This room offers city views and a flat-screen cable TV and a desk. Tea and coffee-making facilities are provided. 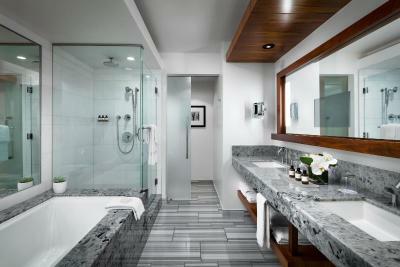 Guests will enjoy the marble spa bathroom. Private parking is available on site (reservation is not needed) and costs CAD 55 per day. 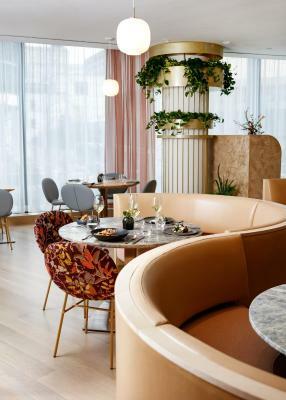 On the higher floors, this room features a flat-screen TV, a desk tea and coffee-making facilities, and a marble spa bathroom with views of the city. 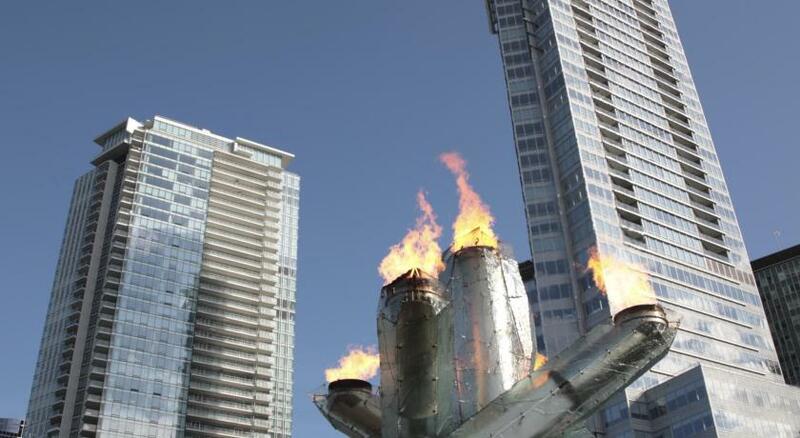 Located on the 20th or 21st floor, this room offers city views and a flat-screen cable TV. 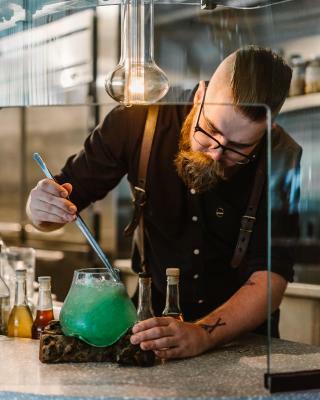 The room also offers: private check-in, concierge and butler services, access to the lounge which serves a daily breakfast and evening canapes. 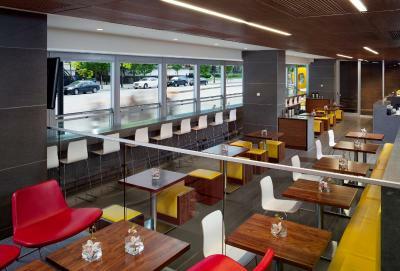 Guests have access to a shared lounge terrace that overlooks Stanley Park, the North Shore Mountains, and Coal Harbor. 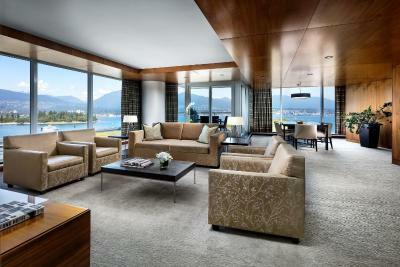 This room features unparalleled views of Coal Harbour, Stanley Park and the snow-capped North Shore Mountains. 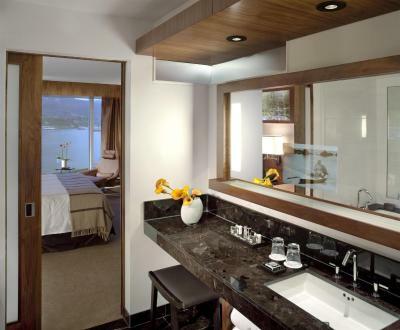 This elegantly furnished room has modern, contemporary décor and luxurious oversize marble spa bathrooms. These rooms have king beds. This suite has a sitting area with a flat-screen cable TV. 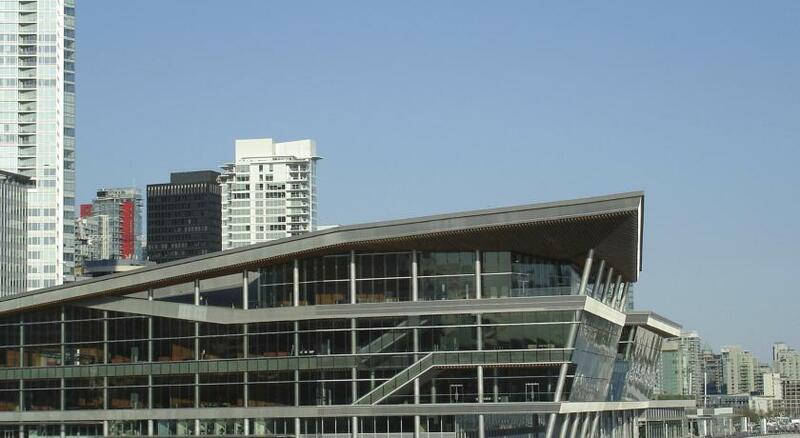 Views of Coal Harbor and Stanley Park can be enjoyed. A sofa bed and 2 bathrooms are available. 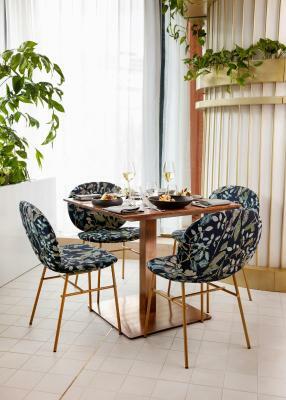 On the higher floors of the hotel, this room features a flat-screen TV with cable, a desk, city views and a private bathroom with marble furnishings. Fitted with a modern contemporary décor, this room features a flat-screen TV and a desk. Tea and coffee-making facilities are provided. 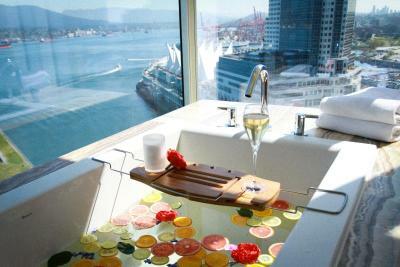 A marble spa bathroom and partial harbor and city views are included. Fitted with a modern contemporary décor, this room features a flat-screen TV and a desk. Tea and coffee-making facilities are provided. A marble spa bathroom and pool views are included. 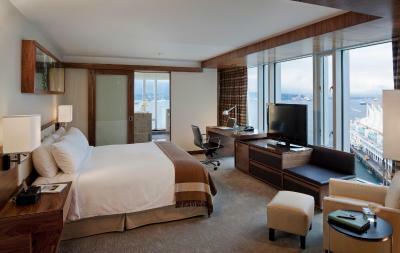 This room offers panoramic views of Coal Harbor, Canada Place and the North Shore Mountains. It featuring an oversize marble spa bathroom. 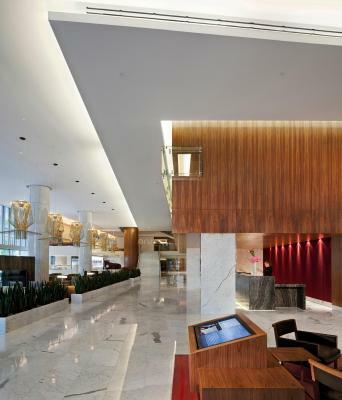 Located on the 20th and 21st floors, this spacious room provides private check-in, personalized butler and concierge services. 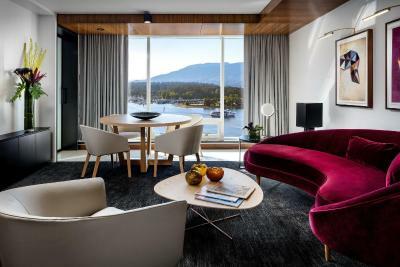 An exclusive lounge located on the 20th floor features a daily complimentary deluxe breakfast, evening canapés, and a private terrace overlooking Coal Harbor, Stanley Park and the North Shore Mountains. 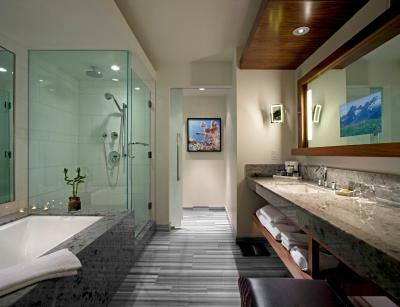 An oversize marble spa bathroom is offered for guest comfort. This room offers city views and a flat-screen cable TV and a desk. Tea and coffee-making facilities are provided. 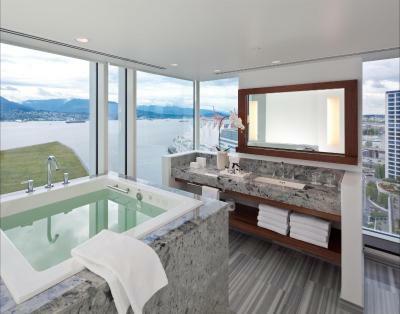 A marble spa bathroom and views of the city are included. 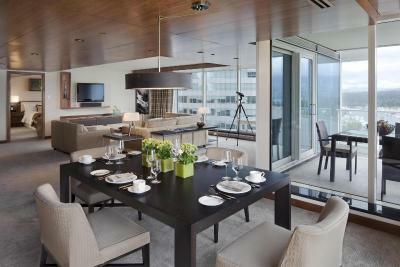 Located on a higher floor and fitted with a modern contemporary décor, this room features a flat-screen TV and a desk. Tea and coffee-making facilities are provided. A marble spa bathroom includes a jetted tub. 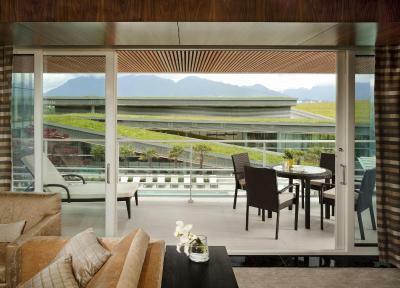 This room offers panoramic views of Coal Harbor, Canada Place and the North Shore Mountains. It featuring an oversize marble spa bathroom with a Japanese deep soaker Ofuro jetted tub. This one bedroom suite features a private patio with an outdoor fireplace overlooking the pool. Two oversize marble spa bathrooms, a bedroom and separate living area with a double sofa bed are provided. A small pantry area with sink, microwave and refrigerator are included. 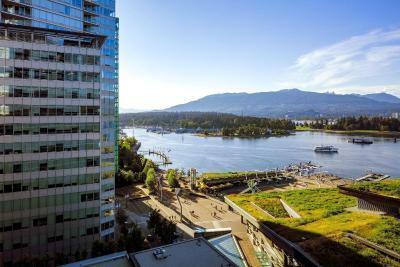 This one bedroom suite features a private patio with a view of Coal Harbor and Stanley Park. 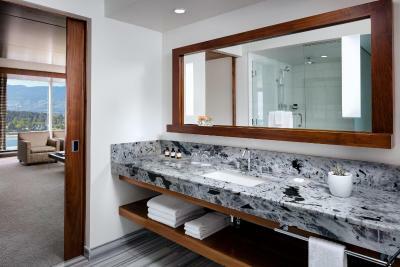 And oversize marble spa bathroom is provided in this corner suites. A bedroom and separate living area with a double sofa-bed and additional half bathroom are provided. 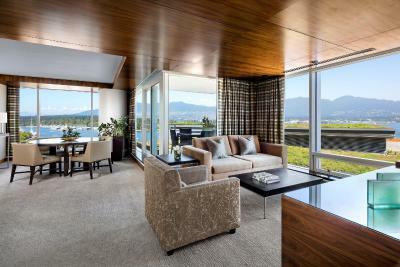 This corner suite features spacious views, a private patio, and two full marble bathrooms. 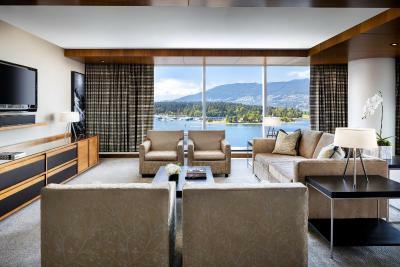 A personalized butler and concierge service, an exclusive lounge located on the 20th floor featuring daily complimentary deluxe breakfast, evening canapés, and a private terrace overlooking Coal Harbor, Stanley Park and the North Shore Mountains is enjoyed. This open-concept suite features a spacious living room, two marble bathrooms, and a large walk-in closet. A custom vinyl collection and record player is enjoyed. 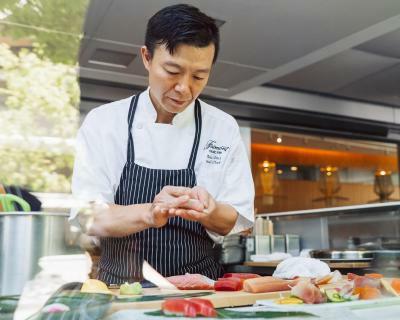 A personalized check-in, exclusive concierge, a signature lounge featuring daily breakfast, evening canapés, and an outdoor terrace overlooking Coal Harbor, Stanley Park and the North Shore Mountains. 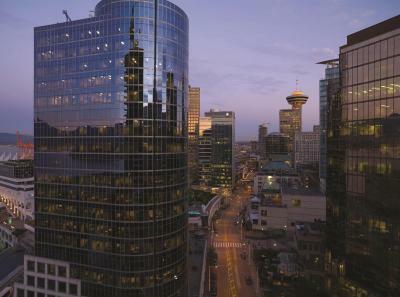 Located on the 21st floor, this spacious one bedroom suite offers views of Stanley Park and Coal Harbor, two full bathrooms, a King size bed and double sofa-bed. 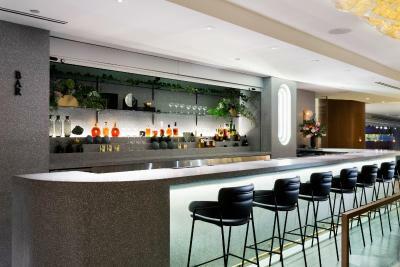 Private check-in, personalized butler and concierge services, an exclusive lounge featuring daily complimentary breakfast, evening canapés, and a private terrace are all provided. WiFi is available in all areas and costs CAD 15.62 per 24 hours. 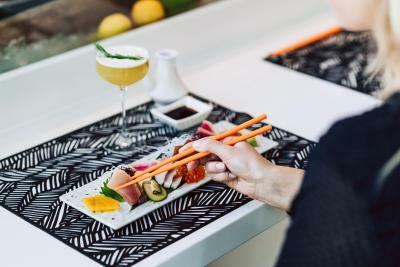 House Rules Fairmont Pacific Rim takes special requests – add in the next step! 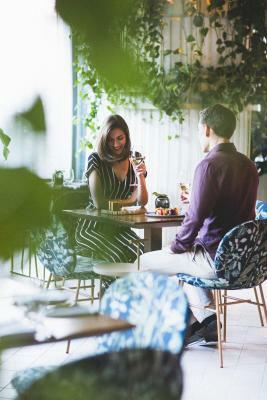 Fairmont Pacific Rim accepts these cards and reserves the right to temporarily hold an amount prior to arrival. Guests booking 4 or more rooms over the same dates will be subject to a one night prepaid, nonrefundable deposit per room at the time of booking.